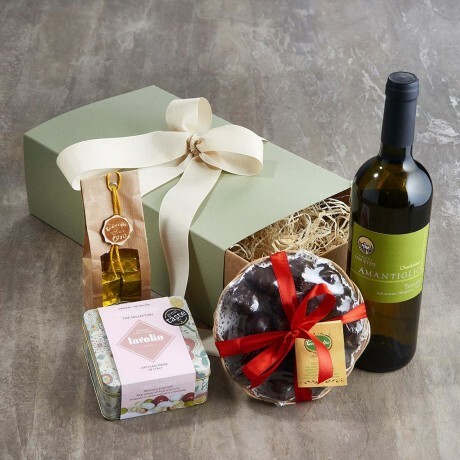 Tell her you love her with this indulgent gift box! If you are looking for something a little different and a little luxurious this is the perfect gift that is sure to please. Our Chardonnay is organic (less likely to leave her with a headache!) and our artisanal chocolates and confectionary taste amazing and are all hand made with natural Italian ingredients. Chocolate Fig Bites (200g) These soft, sweet and chewy Calabrian figs are complemented by a thick layer of delicious dark chocolate - you'll find it impossible to eat just one! Allergens: sulphites, soybeans, milk, whey, sesame, eggs, gluten. Made in an establishment that also uses nuts.